When you think of fundraising events, the typical ones come to mind. There are walks, and runs, and galas, and golf, and DIY, plus many more. What I never envisioned for a fundraising event is a dog show. A close friend of mine purchased a show dog a year or so ago and began entering the dog in local shows. 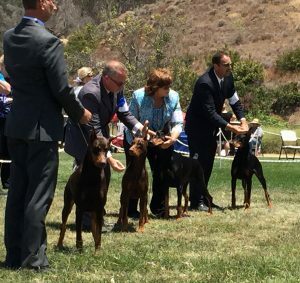 (Lulu the Doberman is now a champion going for the title of grand champion.) Never having attended a dog show, I was somewhat intrigued when I had the chance to go see one. What I didn’t expect was size and scope of the show. Generally held outdoors, this particular show had over 2,000 dogs entered of every shape, size and breed. There were show rings everywhere for the dogs to compete, depending on your breed. Aside from the “show” side of competition, there was an agility competition where dogs ran through mazes, up ladders and through tubes. Obedience was also part of the event where dogs obeyed their masters every command. Along with the many dogs, there where thousands of people, mostly handlers and owners of the dogs and a fair amount of spectators. It was obvious this was a big promotion, and from what I’ve learned they take place every weekend all over the country. What a great opportunity to turn the event into a fundraiser I thought. It certainly lends itself well to a family activity. What kid wouldn’t enjoy seeing the teeny, tiny Chihuahua; all the way up to Great Danes that reach 200 pounds. You can watch them do their thing in the ring, pet them since there are dogs everywhere you turn, talk to experts about the dogs especially if you are in the market for a pet and watch the handlers prepare the dogs before they go in the show rings. What a great way to spend the afternoon with the family. And don’t forget the vendors. Need a dog toy, how about a new bed, or a leash or a snack. You name it and you can buy it for your pet. There was even a dog massage vendor to relax fido before he goes in the ring. How it would work as a fundraiser needs to be determined, but I’m sure there are many ways to make it work with such a large crowd. If you are looking for something different with an event that is established, well run and offers great family entertainment then give your local kennel club a call. Every community has them and they would be a great starting place to see what options might be available. Who knows, maybe dog shows can be the next great fundraising program after endurance events. Check it out! What are the top 10 most effective promotional items? OK, so where have I been? How safe is your event?